Antiseptic, antifungal and antiviral. Eucalyptus Smithii Essential Oil has a slightly more herbaceous-woody type eucalyptus aroma that is not as fiercely penetrating as other species of Eucalyptus when inhaled for respiratory relief . This makes it safer with young children and the elderly, since like Eucalyptus Radiata it has a lower 1,8 cineole content than others, making it the preferred choice for many aromatherapists. When used in diffusers or inhaled from a tissue, the decongestant action of Eucalyptus Smithii Essential Oil helps to relieve chestiness by gently loosening phlegm. It helps clear sinusitis or a stuffy nose, as well as helping to stop coughs and colds spreading due to its effective antiviral action. Use it in massage blends or a bath to ease general aches and pains, muscular fatigue, stiff joints, and to revive muscles after sports. 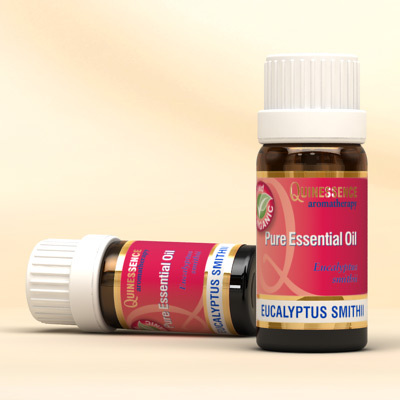 Eucalyptus Smithii Essential Oil is considered to be non-irritant and non-sensitising, however never use this oil with children under the age of 2 years. If a baby inhales the vapour of the undiluted oil it may cause spasm of the epiglottis as a reaction to the sudden cooling effect on the respiratory system.